The Tadoba Andhari Tiger Reserve is predominantly a Southern Tropical Dry Deciduous Forest that comprises about 87 percent of the protected area and dense woodlands. There have been around 141 species of trees and plants belonging to 58 botanical families recorded in the reserve, which consist of trees, shrubs, herbs, and grasses. 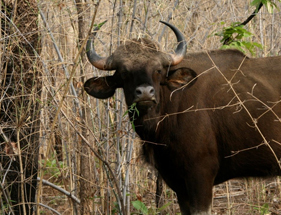 Some of the important details of the flora in Tadoba National Park are highlighted below. Three species i.e. Hyptis Suaveolens, Lantana Camara, and Parthenium Hysterophorus are found as invasive weed species in Tadoba. Teak is the predominant tree species here. Axlewood Anogeissus Latifolia is a fire-resistant species growing here and the Palas or Flame of the Forest Butea Monosperma are colorful plantation that gives vibrant touch to the dense forest of Tadoba. There are many Black Plum trees around here, which grow in the riparian habitat near the lakeside. Tadoba National Park is also a great habitat for Arjun trees that grows at the waterhole at Panchadhara. There are several medicinal plants here like Kach Kujali (used to treat Parkinson's disease), neem, Bheria, Bija, and Beheda. Patches of grasses and bamboo thickets are found as common plantation here. Teak and bamboo are the most popular species of trees in Tadoba. Other major species of trees found within the protected area are- Bor Bel, Beheda, Hirda, Karaya Gum, Mahua Madhuca (crepe myrtle), Lannea Cormandelica (wodier tree), Chichwa, Dhawada, Kusum, Mahua, Mowai, Phetra, Rohan, Shisham, Sisoo, Shivan, Surya, Sirus, and Jamun.